• There are 131 rooms and 17 suites. • Goya restaurant, the Terrace & Gardens restaurant, the Lobby bar and the Velazquez bar. • Conferences and receptions facilities, a business center, a wedding and reception facilities. • Located between the Prado and Thyssem-Bornemhisza museums, close to the Zarzuela Theater. • 1850: Birth of Cesar Ritz in Niederwald, Switzerland. • 1867: Cesar Ritz comes to Paris at the occasion of the Exposition Universelle and starts working as a young waiter in different Restaurants. • 1881: Ritz becomes the Director of the Grand Hotel de Monte Carlo. • 1888: Ritz and his partner Auguste Escoffier buy a restaurant in Baden-Baden. • 1889: Sir Richard d’Oily Carte convinces Cesar Ritz to becomes the Director of the his famous Hotel Savoy in London. • 1896: Cesar Ritz creates the Ritz Hotel Development Company. César Ritz decides to create a new style of Luxury Hotel destinated to clients ready to pay a very high price under the condition he offers them what they cannot find anywhere else. • 1898: Opening of the Hotel Ritz in Paris. • 1906: Opening of the Hotel Ritz in London. • 1907: King Alfonso XIII of Spain is very impressed by the glamour of the Ritz Hotels in Paris and London. The King wants Cesar Ritz to open a Hotel in Madrid as well. • 1910: Opening of the Hotel Ritz in Madrid. • 1926: Acquisition of the Ritz by the Belgian Georges Marquet (1886-1947), founder of « Compagnie Internationale des Grands Hôtels Européens », later part of the Compagnie Internationale des wagons-lits. 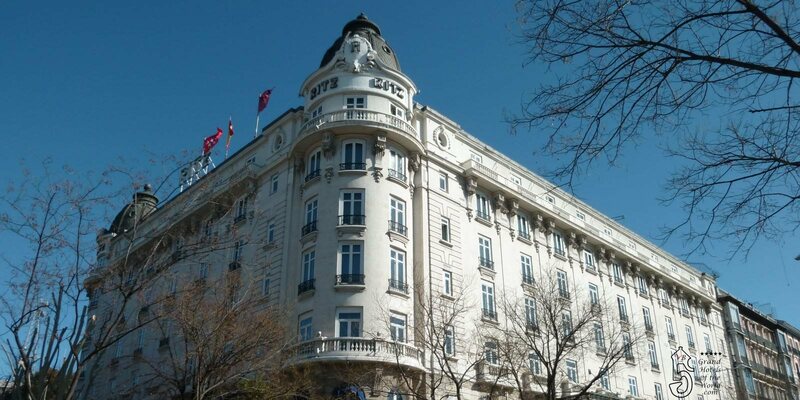 Marquet also owned the Palace Hotel Madrid located opposite the Ritz, he had founded in 1912. • 1947: After the death of Georges Marquet, the Ritz and the Palace remain in the Marquet family. • 1956: Honeymoon of Grace Kelly and Prince Rainer of Monaco. • 1978: Acquisition of the Hotel Ritz by Enrique Masso. Masso also buys the Palace Hotel. • 1981: Acquisition of the Hotel by Thrusthouse Forte for 1 billion Pesetas. Brown’s Hotel later became of the 21 « Exclusive Hotels by Forte », the top segment of the conglomerate including 800 Hotels, from the most luxurious hotels to the most economical roadside inns. • 1993: Hostile takeover of THF (Thrusthouse Forte) by Granada, a British Media conglomerate. As a result of the takeover battle THF was dismanteled and the Hotels were sold one by one. Two of the children restared a new Hotel company called Rocco Forte collection (see also Rocco Forte Balmoral Hotel). • 1996: Acquisition of the Hotel Ritz by the British Hotel Chain Orient Express and the Spanish Businesswoman Alicia Koplowitz for 125 million Euro. • 2014 March 10: The « Orient Express » Hotels brand is rebaptised « Belmond ».